Good British pub food has made a comeback - and this menu takes the traditional dishes and adds a little twist. It's all fresh, cooked on the premises and sourced carefully from local suppliers wherever possible. Dedicated to buying British meat and local veg and being conscious of animal welfare, The Whalebone still manages to deliver great food at affordable prices. Take a look at the menu below - better still come on over and try it for yourself! Please be aware that we use seasonal produce and therefore the menu is subject to change. Layers of potato, spinach, mozzarella, pine nuts & chilli beef rolled as served as a roulade. Roast pepper dressing. 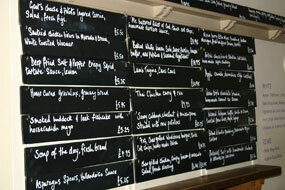 Our menu updates regularly so here is a sample of what you can expect. Made with venison mince and pork sausage meat, hen's egg, 3 mustard mayonnaise, dressed leaves. Fried hen's eggs, thick cut chips & garden peas. Maple cured bacon, Applewood smoked cheddar cheese. Served in a seeded brioche bun with french fries. Salad & homemade ketchup. Mackerel, smoked haddock & poached salmon. With homemade coleslaw, steamed new potatoes, salad & citrus mayo. Piri piri style smoked peppered mackerel fillet, chilled hot smoked peppered salmon fillet, peeled atlantic prawns, seafood sauce, salad, American dark rye bread & tartare sauce. Mixed wild & closed cup mushrooms tossed in cream, white wine, parsley & parmesan cheese. Cherry compote & pouring cream. Candied lemon & shortbread biscuit. Flavours vary in accordance with season. Available by scoop. Burnt toffee sauce & vanilla bean ice cream. Fish fingers, chips, salad. Chicken goujon fillets, chips, salad. Scampi, chips, peas. Chipolatas, chips, salad. Chipolatas, mash gravy. Neapolitan ice cream to follow. "Many thanks for all you did to make last Saturday's party such a very special occasion."